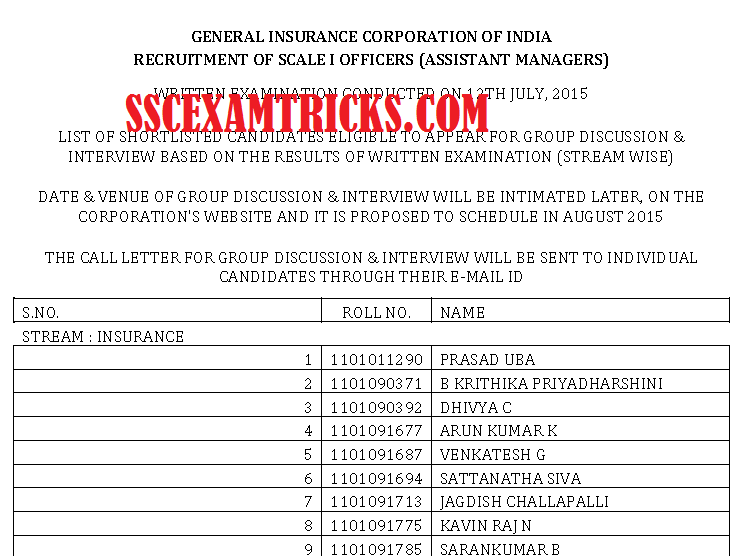 GIC AM Re-exam Result 2015 Declared - Download GIC AM Merit List 2015 - Download GIC AM Interview letter Interview Schedule gicofindia.com. 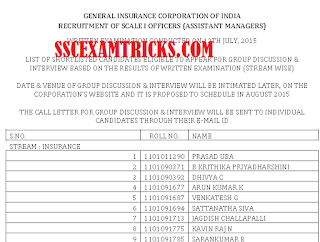 Latest Result News: General Insurance Corporation of India (GIC) has declared result on 24 July 2015 of written test held for Assistant Manager (AM). GIC has shortlisted a total of 186 candidates in various streams called for interview which will be held in August 2015. The GIC AM Result has announced for Insurance Stream, HRD stream, General stream, Finance/ Accounts stream, Chemical Engineering stream, Marine Engineering stream, Aeronautical Engineering stream, Information Technology (Software), Legal stream, Statistics stream, Company Secretary stream and Executive P. A. stream. In GIC Result / Merit list, 84 candidates in Insurance, 03 candidates in HRD, 50 candidates in General, 17 candidates in Finance/ Accounts, 05 candidates in Chemical Engineering, 03 candidates in Marine Engineering, 03 candidates in Aeronautical Engineering, 09 candidates in Information Technology (Software), 10 candidates in Legal, 08 candidates in Statistics, 03 candidates in Company Secretary and 06 candidates in Executive P. A. stream. GIC had conducted written test (Re-exam) on 12 July 2015 at various centres Chennai, Delhi, Kolkata and Mumbai. The result has announced on 24 July 2015. The interview will be held in August 2015. The interview letter will be available 10-12 days prior to the date of interview. The date, time and venue of interview will be available in interview letter. The interview letter will be available on official website www.gicofindia.com. · Mark-sheets & certificates for 10th, 12th & Graduation or equivalent qualification etc.